Another commercial with Barney Edwards and EBS, this time for the Territorial Army. We filmed our reservists on their day job working on the twentieth floor of Canary Wharf Tower (then being built) and afterwards adjourned to a foggy Exmoor where this shot was taken. 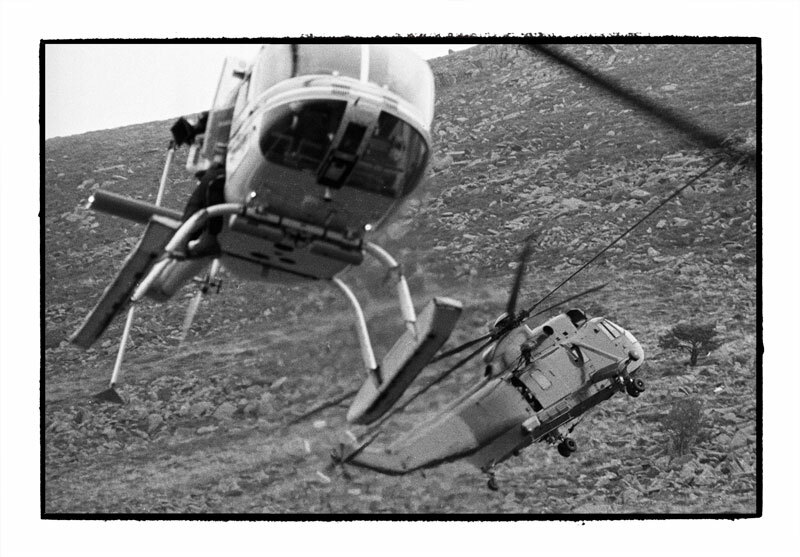 The cloud base was low, so our camera Jetranger and the Army's Sea king danced a merry Fandango in a narrow valley all under 500'. You can see the cameraman and camera in the open doorway of the Jetranger to the left. Interestingly, this was one of the three times in my life that I almost got myself killed. We were filming inside the Sea King and I was replacing magazines on Barney's Camera while the helicopter went into a hover, landed, desoldiered, lifted off, landed, resoldiered, then did it all again. Naturally, this was long before health and safety, and camera crew have historically been considered exempt from potential harm. Anyhow, I needed an extra magazine and was about to step out to get one, only to discover that in all the ups and downs I had confused the two, and thought, well, you get the picture. I had a very long drop ahead of me, so decided to wait until we had landed ... Hmm. Easily done.